The trouble with a total eclipse in North Georgia is that it attracts Atlanta traffic. US 23 figures as a fine road to the Appalachians; we’ve taken it to Tallulah Gorge for hikes without a hint of delay; but add every third Atlantan with an interest in astronomy and you’ve got yourself a mess. I drove up from Atlanta to get inside the celebrated “path of totality”: in essence, the streak of moon shadow — actual interposition of the moon between us and the sun — which moved so fast it crossed from northern Oregon to Charleston, SC in less than 90 minutes. Probably it was the most impressive shadow to darken in the North American continent in my lifetime: To me, it was worth fighting the traffic. I don’t know if you’re ever entered a rural gas station with simple natural plans in mind, only to discover that the line for the restroom exceeds 20 minutes, snaking around through the rows of junk food like a sweaty, overfed human serpent. Well, without wasting too much time on description of feelings, I can record that it is a bit of a letdown. Or maybe a thwarted letdown. Call it what you will. In due time I pushed on. On the north side of Tallulah Gorge, folks commenced to stable their motorcars at the nearest green space, so I did the same. The crowd was diverse: Families, young folks, old folks, college kids, two local school buses letting out a crew of chattering children. A kindly middle-aged black man warned me off from the red ant pile near my car. A car with Colorado plates honked fraternally at my Coors (brewed in Golden, CO) tee shirt. With 30 minutes to spare until totality, I walked past the state park ranger station and had a look around. There was a certain awkwardness: why the hell are we all just standing around, looking up at the hot sun? The occasional moment of skepticism creeps into the mind: what if nothing happens? Did the scientists measure precise celestial motion correctly? What if NASA miscalculated? Are we quite sure we haven’t all been taken for suckers? And then, right in the middle of the Southern August heat and humidity, at the height of the day’s sun, a noticeable drop in temperature. A girl off to my left announced it: “Hey, do you feel that? It just got cooler, Mom!” And she was right. Presently I became aware of the weirdness of the shadows. They didn’t seem quite right. The edges should have been crisp and stark, but instead evidenced a strange fuzziness. Indeed, the light in general gave the impression of the kind of haziness I associate with that post-thunderstorm soft glow you get when the sun returns after heavy rain. Crickets and cicadas cut loose with their evening noise. Those specialized sunglasses they give you have an odd effect: Sure, they allow you to see the gradual eclipse of the sun, by staring safely straight at it; but they prevent you from taking a full glimpse of the world around you. So you find yourself hurried by events. “Holy moly, look at the sliver of the sun!” someone exclaims — and for good reason, for with the aid of those glasses the sun is receding rapidly from view. But then, right next to you: “Dad, the light seems so weird!” This is absolutely true: look back down to earth, remove the glasses, and glance around. The weird decaying light, now joined by a crackling energy, was approaching something like twilight. I noticed a few newer model cars with automatic headlights lit up. The thought stole into my mind that probably some poor soul, going about his business down there on US 23, somehow oblivious to the astronomical events and infuriated by the inexplicable traffic, suddenly found himself facing more terrifying mysteries: the sudden approach of evening six hours early. Truer words have never been uttered. A pulsating shimmer crossed the world. It took our breath away. Hearty cheers for the darkness from crowds down by the highway. What in prior times would have inspired inexpressible terror and revulsion now drew applause and a joyful sound. For around two minutes, we’re all spellbound by the magic of the heavenly bodies. Every visible horizon suggests a magnificent imminent sunset — or sunrise. Venus and (I think) Jupiter sparkle, clearly visible at midday. But the sun itself hangs black in the sky: deep, astounding black; the absence of light where it should always be. Those very planets are visible precisely because the sunlight they reflect is blocked from us by the moon. Then the sunlight returns, a sudden shaft of brilliance: the diamond on the ring of the corona. Twilight has given way to mid-morning, and within minutes to something very close to full sun. A mere fraction of the sun’s light is more than adequate to light the world. As we amble back to our cars, the earlier awkwardness has been replaced by comradery. “That was so cool.” “Just awesome.” “Really amazing.” “What an experience that was.” Strangers exchanging feeble superlatives, wholly inadequate to the task of description; but if language fails, hearts are full, and even the prospect of more hours fighting traffic to get home does not discourage us. What if NASA miscalculated? Are we quite sure we haven’t all been taken for suckers? I wasn't willing to brave the traffic or crowds to see the total eclipse myself. From my front yard it was about 98-99% coverage, which was enough to cause those slightly shimmering shadows on the ground. Those combined with the unexpected noise from crickets was kind of neat. 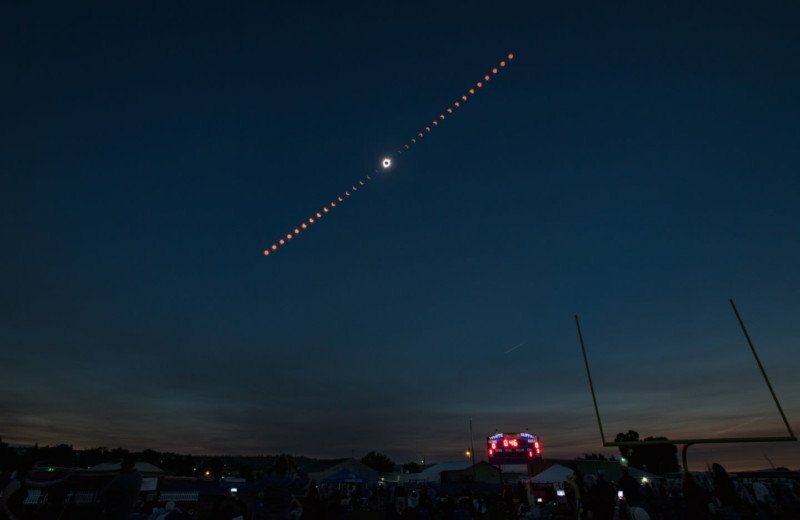 Today I talked to a lady who boated down to a distant lake to view the total eclipse, and much like the cars you mentioned a parade of multicolored boat lights flickered on and gave the event a "Christmas feeling". Cheers. I'm thinking that the difference between partial and totality is more than a difference of degree. I'd say we were at perhaps 85% at our location. We noticed the cooling and the appearance of a different time of day, but there was no sense of energy in the air or strangeness beyond the light. The insects seemed to behave normally, too. What I enjoyed almost more than anything else was going back into the house and seeing how the rooms looked as we approached the maximum. I know my house and all its shadows very well, and we normally have a lot of light inside, with big windows. With the eclipse, it was like a different time of day. You knew it was 2:30, but the amount of light in the room was more like sunset, or right before a storm. That was uncanny and neat. We also had some nice crescent shadows under the tree. Seems a shame we can't keep those glasses for the next one in six years, but they are supposed to be unsafe after three years. That one is in April, though, and in our part of the world that probably means "cloudy." August was perfect. The thought stole into my mind that probably some poor soul, going about his business down there on US 23, somehow oblivious to the astronomical events and infuriated by the inexplicable traffic, suddenly found himself facing more terrifying mysteries: the sudden approach of evening six hours early. I suspect, Paul, that he would have had to have just emerged from a coffin to NOT have known about the planned event. Probably everyone between the ages of 5 and 85 knew about it, at least in this country. The crowd was diverse: Families, young folks, old folks, college kids, two local school buses letting out a crew of chattering children. A kindly middle-aged black man warned me off from the red ant pile near my car. A car with Colorado plates honked fraternally at my Coors (brewed in Golden, CO) tee shirt. You know, when you get regular, ordinary people out of their houses and talking about something common to all and non-political, they act like neighbors and friends and, ya known, PEOPLE. We had tried for over a week to find some location, any location, with the special glasses, without avail. Monday morning, someone at a store mentioned that the library would be giving them out for free. FREE! Not the 25 pairs for $100 which was the only price I could still find online (that were not already sold out, that is. Small wonder.) Starting at 1:00 pm Monday. We trekked over, and (as I predicted), there were several hundred other people doing the same. We were somewhere in the middle-ish. The Library reportedly had obtained 600, and we got our set, but I have no idea if everyone who came got one. But the line (the human anaconda) took a full hour to get through. People were talking to each other - young and old, whites and blacks, whites and Hispanics, blacks and Hispanics, men and women, rich(er) and poor, joking and sweating and reddening under the sun. They were sharing sun umbrellas, the couple in front of us giving aid and comfort to the red-headed toddler and infant (and mother) behind us so they didn't crisp to bacon before our eyes - all without worrying if someone's skin color was the same as theirs. Why can't we do that other times? Indeed, the light in general gave the impression of the kind of haziness I associate with that post-thunderstorm soft glow you get when the sun returns after heavy rain. We had about 89%, I think I heard. That was enough to note the lessening of the light, but not so much that you would have been completely sure something odd was going on, that you could not just attribute to clouds or something. It's amazing that only 11% of the sun's light can come close to the appearance of full daylight. My guess is that light-scattering due to atmosphere accounts for some of that - if there was no atmosphere, we probably would have noticed the difference much more. But I don't know that. Turns out that our cell phones stink at discerning the sun as just a sliver, even when only 10% is visible. With or without the special glasses, I got only a disk. Apparently there are higher-quality phone cameras that would pick it up. Not mine. What in prior times would have inspired inexpressible terror and revulsion now drew applause and a joyful sound. For around two minutes, we’re all spellbound by the magic of the heavenly bodies. A joyful time indeed. For all the work America got done yesterday, the states might as well have declared it a holiday, because that's how it was celebrated, more or less. Let us celebrate the sun, and the moon, and the intricate dance that gives us tides and weather and lots more. Downtown Chicago was more like Tony describes -- we were more like 89% covered. Looking through the glasses at the eclipse was exciting -- everything was black at first and then there was the covered orb of the sun peeking through the special lens. There was a big crowd outside trying to get a glimpse of the event -- it definitely had a party feel to the day. We got to watch the total eclipse from our front yard, and it was indeed amazing. I thoroughly enjoyed reading your description, Paul. The thing that may have struck me most, other than the moment the sun disappeared, was the utter stillness about 20 minutes before totality. Not a sound until the cicadas started up shortly before totality. Watching the light fade, seeing the "sunset" all around us (though this wasn't that spectacular because we are surrounded by tree-covered hills) . . . it was all amazing. 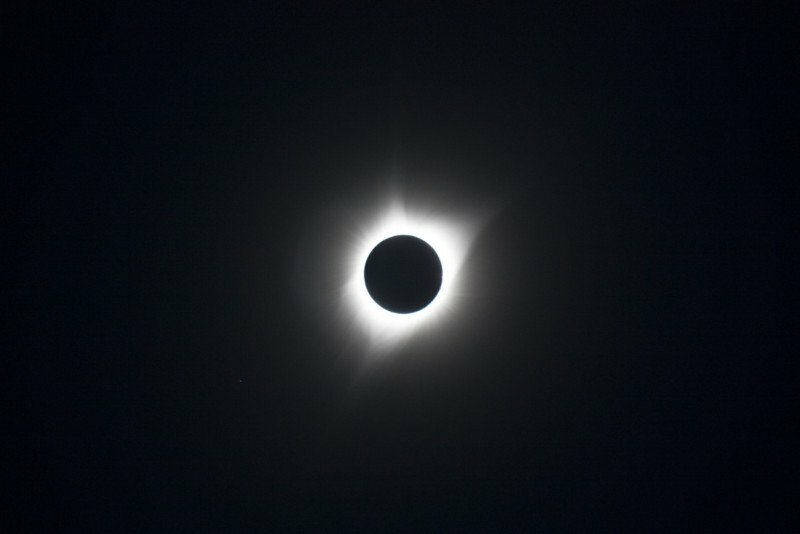 I don't know if these photos my husband took will show up here, but he got one of the diamond ring effect and another of the corona that are really good. Good grief - y'all carry on like a bunch of pagans. Watched the whole thing, on my driveway, in Holt, MO. The moon moved in front of the sun, for two or three minutes. I gazed up & around, the whole time, with no protection, and no ill effects, so far. You may not be blind yet but you've got the worst case of tone deafness. Step2, there can be no doubt that I am, every day & in every way, out of step with the Zeitgeist. I'm even out of step with most of those who are out of step with the Zeitgeist! You're not out of step with the Zeitgeist in posting empty, passive-aggressive comments on blogs.